I had such an amazing time at Bestival last year so I decided to take the plunge and book tickets to go again in September. My friends and I only paying £7 a week rather than all the money upfront so I don't need to worry about my student friends not being able to afford to come because we can all spread the cost, there is a big group of us going and even though it's months away I'm already excited and have started to make preparations. Me, too keen? Never! 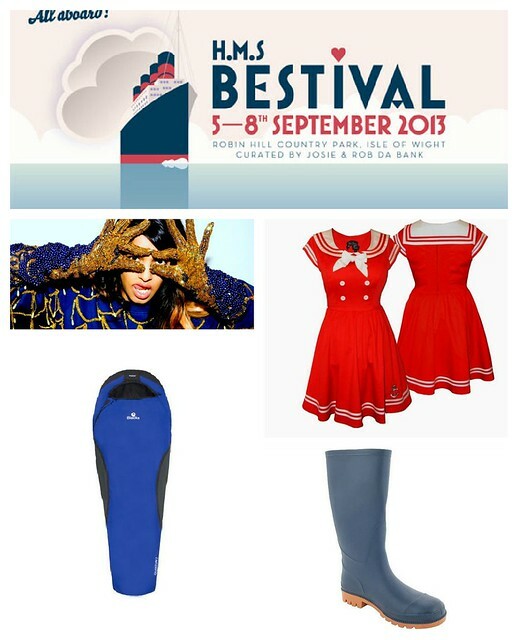 Every year on Sunday the festival has a fancy dress theme, last year was wildlife but this year the theme is H.M.S Bestival and I can't wait to get stuck in putting my outfit together. While searching for nautical themed dresses I came across this Hell Bunny one on Amazon and Ebay a few times. It's super cute, affordable and fits with the theme so I'm pretty sure this will be my dress for Sunday unless my and my friends decide to think more out of the box with out fancy dress ideas and get the papier-mâché out. My experiences at Bestival last year taught me a few things, one of them being that the sleeping bag you used for sleepovers when you were a teenager will not keep you warm in a tent on the Isle of Wight... I was freezing cold all night and had to buy a duvet there. I've now got my eye on this cosy Blacks sleeping bag that will keep me warm and will zip up around my face so my arms don't get cold, perfect! I'm also on the lookout for a snazzy tent so if you have seen any please let me know where I can get one from. I'm not the kind of girl to have a green tent, I'm thinking floral or polka dot! Another thing I found out is that you may have glorious sunshine for three days but the heavens will open at some point so you better take some sensible footwear to be safe and I'm loving these blue wellies (good for the nautical theme) which are only £15. Most importantly I discovered that you wont see all the bands you want. Pick a few essentials that you don't want to miss but for the most part just go with the flow, discover new things and it's not all about the music. I will be happy if I see M.I.A, Bastille and Peace this year and want to get everyone together to watch Elton John. Elton might not be everyones cup of tea but you have to admit he's got a pretty amazing back catalogue. Have you started making plans for summer yet? Those dresses are so cute. The Bestival lineup is amaaaazing!